I woke up early this morning anxious to check out and go sailing. My alarm went off at 5am, I showered onshore at Conch's showers, then strolled out to see the sun rise and walk around the docks, and watch morning happen in Road Town harbor. Turns out everyone runs on island time, so there isn't much happening until at least 7am when a couple of other bareboat captains got up to watch the empty docks with me. Conch Charters' staff showed up around 8 and were busy all morning preparing boats, walking skippers through yacht functions, and otherwise getting the boats out on the water. About 830am a guy from Renport showed up with my USB Modem for the week so I could have internet access in case of an emergency at work. It took him about 10 minutes to get it set up on my laptop, and it has worked very well thus far. He said there were two places in the BVI with poor coverage, otherwise the modem could reach everywhere. One of those places was the Bight at Treasure Island (Norman Island) where we'll be tonight, and the other was some other place I cant remember right now. But I'm sure we'll find it. While waiting for the boat orientation and chart briefing, I pulled out the charts, my itinerary, and Conch's chart rules to find any problems. I found a couple, which were really good to know. Most charter companies do not allow you to take boats into dangerous areas, i.e. places with difficult navigation, strong currents, or other hazards to their boats. The staff member who checked us in the night before, Emma, was going to do our boat orientation. While we waited, we walked down to the Rite Way supermarket which is about a 3 minute walk from Conch's offices. We picked up razors, more sunscreen, and a few other items. The inverter in our boat was mounted to a wall in such a way that my laptop charger would not plug into it. I wish the engineers who designed chargers actually had to use their own products - it would save the rest of us a lot of headache. Luckily, Rite Way had a small overpriced powerstrip that would do the job perfectly. Conch Charters runs a very impressive operation. When Emma was going over the engine operation, we heard one of the engine's belts whine after startup for a few seconds. This is a very normal occurrence for belts and did not concern me as it stopped so quickly. However, at the end of the boat briefing Emma called one of the mechanics over to check it for us. He started and stopped then engine a couple of times and we could no longer hear the whine. But he went ahead and quickly changed the belt out for a new one. That kind of attention to detail and quality is pretty rare. Conch runs a tight ship, literally! The chart briefing went really well. 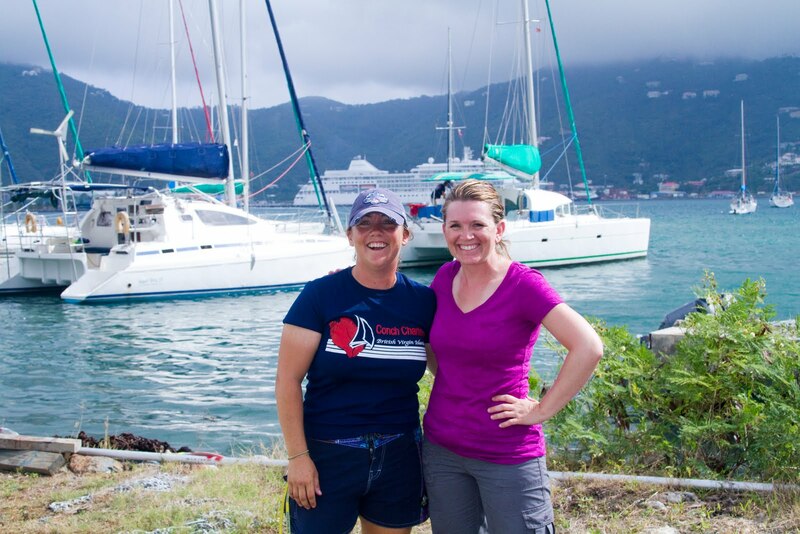 Irene was very knowledgeable about each of the islands, anchorages, restaurants (including chefs, menus, and prices), and helped us make some adjustments to our itinerary to make sure we had the most fun possible. Finally, we were ready to go. To help navigate out of the Fort Burt marina without running into the sandbar, a Conch staff member rides along with you out to the channel. Once in the channel, they jump off to an accompanying dinghy to return to the docks and let you get on your way. There is a sandbar near the marina that has grounded more than its fair share of boats. I absolutely LOVE the wind in the British Virgin Islands. It is so constant and steady. Winds were running about 15 mph out of the Northeast. We were headed for Norman Island, which was just a bit off a broad reach. There were a lot of Moorings charter boats headed out at the same time, so we decided just to pull out the jib for a bit and later, once we were clear of the other boats, turn upwind to raise the main. The history and legend of Norman Island, or Teasure Island as it is known locally, was the inspiration and setting for Robert Louis Stevenson;s book "Treasure Island". And the stories aren't just stories. There are still several unlocated chests of silver on Treasure Island. Numerous companies and ventures have been formed over years to try and locate them. The last find was in 1910, when a chest of silver was found in the caves on the west end of Norman Island. Under jib alone we were making about 7 knots. There were slight swells running, probably 6 feet but spaced comfortably far apart. Noel got a wee case of mal de meer, but switched to sitting on the leeward side of the cockpit where she had the wind in her face and could see the swells rolling into us and within 20 minutes was feeling much better. It's very difficult to describe how BLUE the water is down here. I kept feeling like I was sailing across someone's screen saver. The run to Treasure Island was a brief afternoon sail. 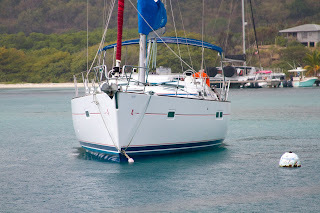 I was beginning to understand much of the advice I'd read about sailing the British Virgin Islands. The sailing really was "line of sight". I had loaded waypoints on my Garmin GPS, but only needed to use the GPS in a few locations, or possibly if I ended up sailing in the dark for some reason. The islands are close enough together that you can easily identify your location by looking at the nearby islands. And there are very few hazards to navigation, most of the approaches are clear, and any hazards are well marked. 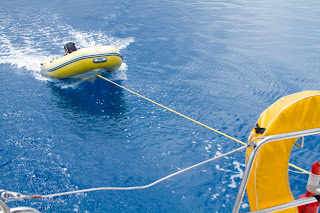 This was our first time picking up a mooring ball on our own since our ASA certification some time ago. In all of our sailing, we either anchor or dock, but have not used mooring balls since sailing in Galveston a few years ago. So we were a little concerned that the happenings of the next few minutes not end our marriage. There are plenty of stories about the frantic, stressful shouting matches between a wife on the bow and a husband at the helm. So we went over hand signals, and approached the mooring field very carefully. We approached into a 15 knot wind while my wife tied one line to a bow cleat and stood hanging over the bow. She looked good up there, like Ned Land, king of Captain Nemo's harpooners aboard the Nautilus. After a few quick hand signals, she reached over and hooked the pendant on the very first try. I was so proud I almost forgot to run up and help her secure the lines. The mooring system here is color coded to help you know which are overnight moorings and which are for day use, large commercial vessels, dinghies, etc. 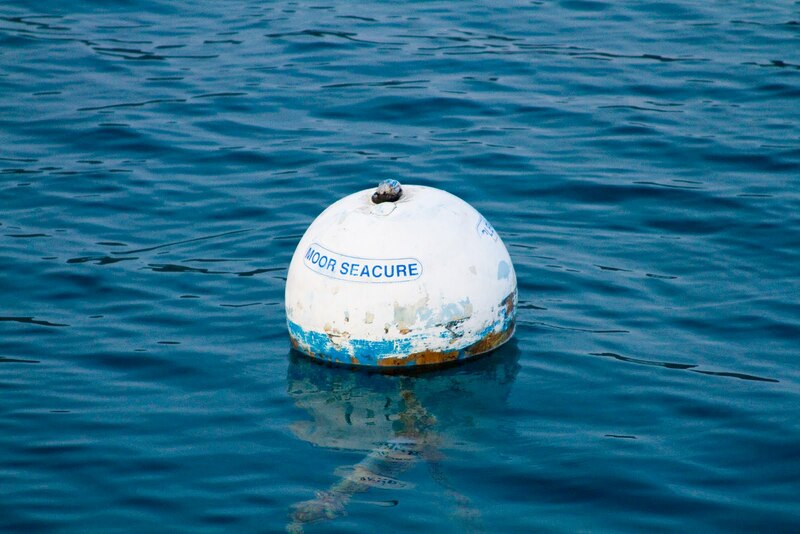 The overnight mooring balls are white, and have the managing company's name written on them. After you pick up the mooring, you stop by that business ashore to pay for the night's mooring. In most anchorages, you don't need to try too hard to find the owners, they find you pretty quickly. 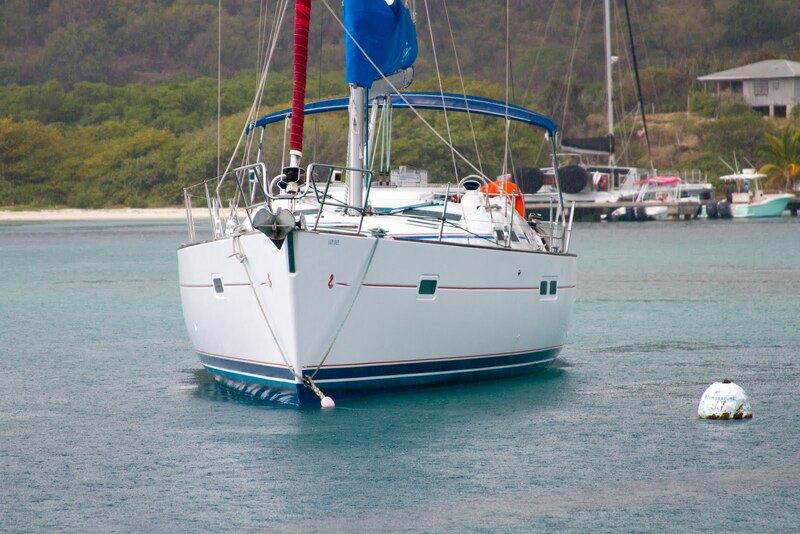 Overnight mooring fees are about $20-25. The person on the bow uses a boat hook to pick up a pendant - a 10-15 foot heavy line with an eye spliced in the end. A redundant bridle is made by cleating a docking line to the starboard bow cleat. The running end of the line is then fed through the pendant's spliced eye, and run back to the same starboard cleat where it is cleated off with a hitch. The a second redundant line is run from the port bow cleat in the exact same manner. This two part bridle provides redundancy in case of a line failure, and also prevents the boat from riding too far back and forth along the line, which could chafe the bow. The boat in this picture is only using a single line. Once secured, we swung peacefully on anchor with the other boats in the anchorage and watched the sun set. The anchorage was dotted with dozens of sailboats. Many were eating dinner on board, some were headed over to the (in)famous Willy T, a floating bar, and others were headed in to the beach to a small restaurant there. We had been given a tip to choose a mooring far from the Willy T, unless we wanted to be up til the wee hours of the morning listening to the thumping music played for its patrons. For dinner that night we barbecued steaks out on the grill. With just two of us on the boat, there was so much extra room. We enjoyed dinner and relaxed for the evening watching the stars overhead.